We look forward to welcoming you to our dental family. Our office is warm and inviting, and you will always be greeted with a smile. As an added convenience for our patients, Northern Dental Group, P.C. accepts all insurance and participates with Delta Dental Premiere, Delta Dental Healthy Kids and Blue Cross Blue Shield. 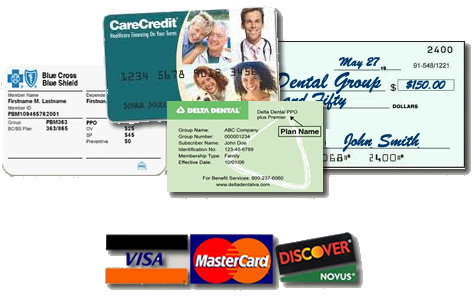 At Northern Dental Group, P.C., we offer a variety of payments for your convenience. You can pay with Cash, Check, Discover, Mastercard and Visa, as well as Care Credit. Payment is expected at the time of service. CareCredit is here to help you pay for treatments and procedures your insurance doesn't cover. We offer No Interest financing or low minimum monthly payment options so you can get what you want, when you want it. You can even use CareCredit for your family and favorite pet. With three simple steps, including an instant approval process, it's easy to apply for CareCredit. After you're approved, you're free to use CareCredit for the services you choose including, dentistry, LASIK, veterinary, hearing aids and more. CareCredit is endorsed by some of the most credible organizations specific to each healthcare profession we support. CareCredit is a GE Money Company, so you know you can count on us. For over 20 years, we've been helping over five million cardholders get the healthcare treatments they want and need.